The Best Investors and Their Worst Investing Mistakes | Pure Financial Advisors, Inc. Even the best investors make terrible investing mistakes. 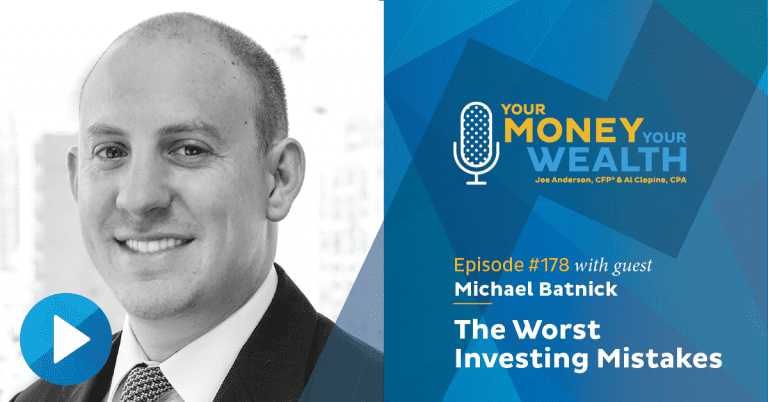 Michael Batnick talks about his new book, Big Mistakes: The Best Investors and Their Worst Investments. Plus, should you sign up for Medicare, and which parts? And, Big Al’s got 5 smart ways to collect more Social Security benefits, and the fellas answer the question, can you still take a lump sum from those benefits to buy a red Ferrari? (36:58) Can I Take a Lump Sum Social Security Benefit to Buy a Red Ferrari? (40:33) Should I Apply For Medicare? Which Parts? That’s Michael Batnick, author of Big Mistakes: The Best Investors and Their Worst Investments. Today on Your Money, Your Wealth, Michael shares the investing blunders of Warren Buffett, Jack Bogle, and Mark Twain and more, and what can we learn from them. By the way, make sure you don’t blow up your retirement – click “Special Offer” at YourMoneyYourWealth.com and download our Quick Retirement Calculation Guide for free. Spend 10 minutes to see if you’re on track for the rest of your life. Plus, should you sign up for Medicare, and which parts? And, Big Al’s got 5 smart ways to collect more Social Security benefits, and the fellas answer the question, can you still take a lump sum from those benefits to buy a red Ferrari? Now, here are Joe Anderson, CFP® and Big Al Clopine, CPA. JA: Super excited here today. We got Michael Batnick on – The Irrelevant Investor. You got to check out The Irrelevant Investor, it’s a wonderful blog – and one of the best podcast hosts, besides you. JA: Way better! Animal Spirits. 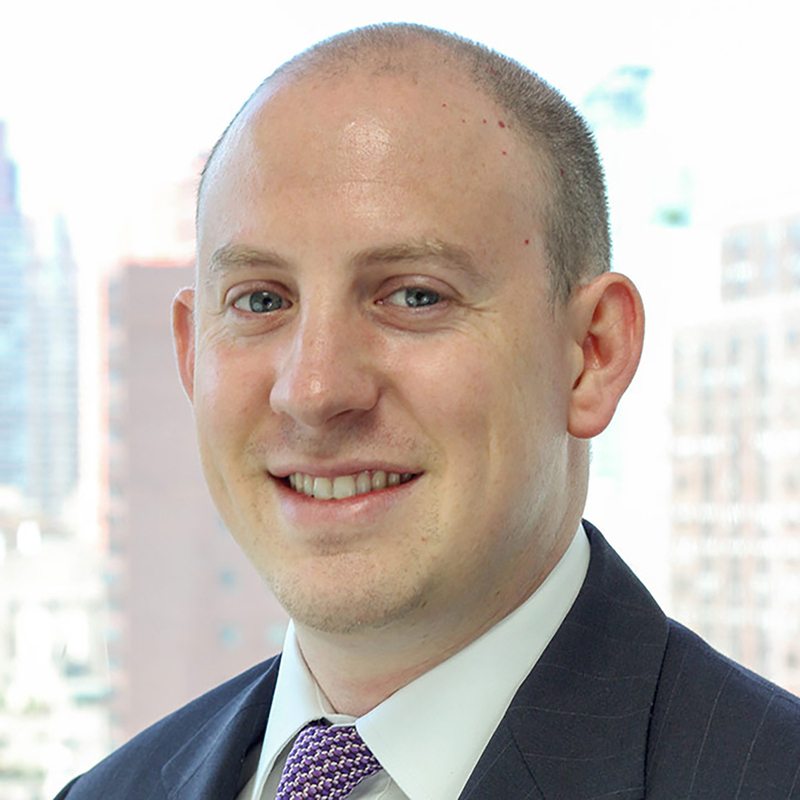 Michael Batnick is the director of research at Ritholz Wealth Management, it’s an RIA headquartered in New York City. He sits on the investment committee and is responsible for portfolio construction and in-house risk management strategies. Michael is the author of the Irrelevant Investor blog, where he aims to educate people about investing. He’s the co-host of the weekly podcast, Animal Spirits with Ben Carlson. Michael is also the author of the new book that we’re here to talk about, Big Mistakes: The Best Investors and Their Worst Investments. Michael, I know you’re a busy guy. I really appreciate you taking some time. Want to dive in. So first of all, thank you, welcome to the show. MB: Thanks for having me. Appreciate it. JA: Well some of these pretty smart people made some catastrophic mistakes. MB: They did. I mean one of the catastrophic ones that comes to mind is certainly LTCM, Long Term Capital Management. If you want the full version, I would suggest reading Roger Lowenstein’s When Genius Failed. But their deal was, they were the smartest guys in the room, quite literally, they had Nobel laureates, the guys that created the Black Shoals model, and what happens is Economics 101. What they were doing was working really, really well. They found inefficiencies in the market. Competition came in. They needed to lever up because the spreads were getting narrower and narrower, and then, kablooey. So I think that there’s a really practical lesson for everyday investors, especially those of us who think we’re above average, which is basically everybody. If you’re fortunate enough to have saved enough money for your future, then chances are you’ve had a decent education. And then, chances are you think that because you’re successful studying medicine or engineering or whatever the case may be, that that could translate into the markets. And that is not the case at all. JA: I read that book, and it is amazing how bad that whole Long Term Capital Management just blew up the entire market. These are the smartest of the smartest people in the world, and if the smartest people in the world make those types of mistakes like you were saying, a lot of people are overconfident. “I have a degree. I’ve saved some money. I’ve got a million bucks. I’ve done pretty well.” And so that overconfidence always gets individuals into trouble. And all of these individuals that you write about are perfect examples of that. MB: I think one of the truly seductive things about the market is, even though genius might not be rewarded, you only need to get lucky once. And the bank doesn’t care how you how do you make your money. If it was luck, they don’t say, “sorry, that money is no good here because it wasn’t skill, it was luck.” And I think that’s what keeps people coming back time after time. Hope certainly sparks eternal. JA: This book is written well. Really well. It’s like a bunch of little short stories, you know what I mean? It was very enjoyable to read. MB: I do know what you mean. And thank you for saying that. That was very much intentional. I read a lot of books, and I’m very sensitive to the fact that the last thing anybody wants to read these days is a 350-page finance book. So two things that I did: One, I made each chapter under 4,000 words. And they’re not sequential, so if you’re sick of Buffett and Munger, you don’t want to read their chapters, skip it. No big deal. So I wanted to respect the audience and not overwhelm them with words. JA: Who is your favorite person that you wrote about in the book, or that surprised you the most? MB: So many to choose from, the one that comes to mind first is probably Mark Twain. He would have been – man, if you gave him a Twitter account, he would have been deadly. He had quite a way with words, and his problem was that he was easily seduced, especially by entrepreneurs and innovators, and not just that – he blew up all sorts of ways. He invested in gold mines and silver mines. And at the end of the day, he kept throwing good money after bad and was forced to do a round the world standup comedy tour, and there’s a really good book on that, in which he had to literally travel the world to repay his debts. MB: I can’t remember if this was left on the cutting room floor. But one of the people that helped right his ship was this guy Ron Rockhound, somebody or other – he was a Standard Oil partner. And as soon as he got out of debt, he was right after this guy, asking him to get into the syndicates and asking him if he had any stock tips – he did not learn his lesson at all. JA: He was almost 60 years old and he had to take the around the world stand up comedy tour. MB: Yeah he just could not help himself. He certainly was infected with the fear of missing out. JA: What about Warren Buffett? All we hear about is really good things about Warren Buffett. What types of mistakes did he make? MB: Yeah. So one of the things that he did, and this is sort of nitpicking because of course over the course of a 70-year career there are going to be mistakes, but this was certainly a big one. So he had been successful buying some shoe companies and then he took the success that he had with previous ones and was overconfident in buying one called Dexter Shoes, which was a company up in Maine. The big mistake was – and this is not applicable to you and I, because none of us are going to have the opportunity to buy a company with shares in our own stocks. But he paid around, I think, $300 or $400 million for this company, which is now at zero and the shares are worth upwards of $7 billion – so that one stunk. AC: Hey Michael, I got a question. So you wrote about 16 different people in your book. And what were some of the biggest takeaways? Because I think a lot of times we learn from other people’s failures. In fact, I think most successful people have had failures. And what are some of the big takeaways, if you could maybe highlight one or two? JA: What type of advice would you give our listeners on, you know, we’re all going to make mistakes, right? But what are some things that people can do to maybe avoid some of the mistakes before they happen? MB: Sure. So this is a really easy one I think that most listeners can take something away. Bill Ackman. He was shouting from the top of the roofs about Herbalife, and how in the world can you do that, and then change your mind – right? Your predictions and what you tell other people, whether it’s politics or anything – sports, whatever – really become part of your identity. So there’s no reason to be talking to your friends about your best trade or whatever. And if you are going to talk publicly about what you’re doing, if you absolutely cannot help yourself, say, “hey, I like stock XYZ, I’m going to buy it at 100. And here’s why I’m buying it. And if that changes, maybe I will get out, or if it goes below 90, I will get out.” Give yourself an exit plan because if you like something for fundamental reasons or whatever at 100, then you love it at 70 and you love it more at 60 and you love it more 20. I mean, that’s no way to invest. Welcome back to the show, the show is called Your Money, Your Wealth®. Joe Anderson here, Big Al, hanging out. We’re talking to Michael Batnick. Check out his blog, TheIrrelevantInvestor.com. We’re speaking to him about his new book, Big Mistakes: The Best Investors and Their Worst Investments. Even with Ben Graham, he kind of changed his tune over the years. Help out listeners – educate them on who Benjamin Graham is. MB: Sure. So Benjamin Graham is the dean of value investing, he wrote the book called Security Analysis, which basically invented the field. I think he was one of the founders of one of the financial analysis societies, it’s a CFA, I can’t remember right now. But he was a dyed in the wool value investor, and you have to be careful because things were very different back then. What he would do is he would buy a company that was trading at two thirds, less its working capital. And those companies, of course, don’t exist anymore, but they used to exist. And there was a lot of inefficiencies in the market, and as he got older, he really questioned whether value investing the way he did would work going forward. This is like in the ’60’s. So nothing as sophisticated as how trading has gotten today. So he was pretty cautious going into the crash of 1929, and he held a lot of preferred stocks, and then he tried to go in when stocks were down 70% or something, and he was early because stocks looked attractive, obviously, and then he got actually cremated. And the lesson with that is, there are limitations to value investing. I mean obviously. And we’re seeing that today. So that was just one example of many that there are no surefire ways to do this. JA: Well he’s Warren Buffett’s mentor in a sense, right? So he’s the Grand Poobah of investing who taught some of the smartest people now – Warren Buffett is, how old is he now, 95, so… But if you look at how you wrote that whole chronicle of events, he was very smart and found a way to find mispricings in the overall market. But what I found, which was very interesting to me, is that there was only a handful of firms – maybe half the firms on the Dow, that actually had the right reporting, that you could figure out exactly what the heck is going on with the overall companies. MB: I think we take a lot of information today for granted, but back then, there were no reporting requirements, at least certainly not before 1934. What you had was the dividend yield. And, you know, take it or leave it. MB: Right. Exactly. All those sorts of things – he could not even follow his own rules. JA: All these people have their own unique stories. But that gentleman, how many times did he go broke, and then all of a sudden in a couple of months, he’s right back in the game. MB: Yeah, his story is very sad. You’re watching a slow-motion train wreck when you read those books. AC: (laughs) What about Jack Bogle. You got him on the list. What are some of his mistakes? MB: Jack Bogle, I forget exactly how old he was in 1976 when he started the index fund. But he was almost 50 years old and before that he was the CEO of the Wellington Fund, which is one of the four oldest, I believe, mutual fund structures. And what happened was, he got seduced and swept away – like so many other people did in the late 1960s, by the Go-Go Years. There’s a great book called that, by John Brooks, which I would recommend. And the name of the game was just rapid-fire trading, high turnover, and they were getting left behind in their balanced, old, boring portfolio. So what they did was, they brought in a group of young professionals from Boston and they totally veered away from the core of what they were doing, and they ended up in the bottom two percentile of returns over the previous decade. And his mentor, Walter Morgan, who I think was the founder of the Wellington Funds, he felt that he deeply let him down, and was sort of aghast at what he let happen. And I think one of the funny things that Bogle wrote about was, he even started a mutual fund that was using tactical analysis, which is so far afield from his core beliefs. So the lesson with that is, it takes time to find who you are as an investor. Or if you are a trader. And some people just never get there. So, if you’ve had some bad experiences in the past, just keep searching, and you’ll find what suits your personality. MB: Ooh. Yeah, so I was very fortunate in that it didn’t take me that long to smell the roses, and I credit a few things to this, which I’ll get back to in a minute – but one of them is Twitter and the other is a diary that I kept – a journal, I suppose. JA: It’s a diary. It’s a man-diary. (laughs) You got a man purse too? That’s alright. MB: So what I did was, like many other people, the first book that I read from the library was The Intelligent Investor, and I was so excited about what I was reading – the whole Mr. Market thing, of course, really resonated. How could it not. It’s really sort of a light bulb moment. And then I tried doing some really amateur evaluation work. I was just using P.E. ratios and whatever. And of course that didn’t work very well, surprise, surprise. And then I read The Little Book of Common Sense Investing, and I thought, “Oh, of course, this makes sense. If Buffett’s leaving is his money to index funds then maybe that makes sense, and the data is compelling.” So I tried doing that, but that was really boring. And then I found Reminiscences of a Stock Operator, and then the ultimate light bulb – “Ah, I will be the next Jesse Livermore and I will cut my losses short and buy my winners, and that’s really easy to say and really hard to do. So over the course of about two years, I tried doing the macro thing, I tried doing the micro thing, I tried doing the chart thing, and I said, “You know what? I respect the market. It is a ruthless, relentless foe that I have no interest in trying to conquer.” And so I basically ended up with some sort of – I do believe that buy and hold is, to say it works, I mean, obviously, but the reason why it “works” is because it’s, in my opinion, all but impossible. I think that riding through a 60% decline is just not in the cards for most people and I would put myself alongside most people. So I invest in a simple, simple, simple, trend-following model to protect myself from myself. I invest in index funds, and I invest in some quantitative rules-based strategies. I think that, obviously, discretionary managers, there will be some winners, but I have no interest in trying to pick those. So that’s the evolution of where I am today. MB: Not yet. I think the last I shorted was, I can’t remember, but I think I was shorting Green Mountain, which of course got bought out by Coca-Cola probably 800 higher. I shorted Amazon, I shorted Netflix. I mean I made all the mistakes in the book. Luckily, I never took a big loss. But I never took a big win either. I was not one to let my winners run. It just didn’t to my personality. JA: Last question. How the hell did you find time to write the book? I mean, I think you read, like, 17 books a week. I think you binge watch I dunno, what, four or five different Netflix shows, plus you work full time. What did you find time here, brother? AC: (laughs) That’s the truth. MB: So if you want to write a book, have a baby and that’ll be all the motivation you need to hole up in a coffee shop. JA: (laughs) Hey, I know you’re busy – hey, I guess another one. What do you think of LeBron here in Los Angeles? MB: In terms of what? JA: I don’t know, what do you think of the trade? You’re an NBA guy, right? MB: It was not a trade. It was free agency. AC: (laughs) Jeez, get your facts right, Anderson! MB: I think this is fairly well telegraphed. I love good basketball, so I’m not one of the people who is mad at what Golden State is doing. I understand. And listen, I’m a Knicks fan, so it doesn’t affect me. We’re not contending for anything. So I love watching good basketball. So because I’m a Knicks fan and I have nothing to hold onto, the only thing that’s kept me engaged over the last 15 years rooting with everything I’ve got against the best player in the world, LeBron James. So that is what’s kept me engaged. By all accounts, he seems like a great guy, he’s a role model. He’s done everything the right way since he was 18 years old, just beyond remarkable. I don’t think that this team, currently, has any chance to make it past the Rockets or the Warriors. We’ll see what they do in years 2 and 3. Should be exciting. JA: Thank you very much. Where can people find more information about you? MB: You can find me on Google. JA: Oh come on! I want you to promote yourself. I want you to sell yourself. Or do you want me to do it for you? MB: Yeah OK I’ll take a shot at it. I’m @michaelbatnick on Twitter and I do a podcast every week with my partner Ben Carlson called Animal Spirits where we discuss a dozen topics that are going on that are interesting to us. JA: How about your blog, it’s pretty good. MB: Ah yes. My blog is MichaelBatnick.com or TheIrrelevantInvestor.com, that works too. JA: TheIrrelevantInvestor.com. I would encourage everyone to go there and get Animal Spirits, we’ll put all this stuff in our show notes. Michael Batnick, thank you so much. I’m a huge fan. It’s such a pleasure and a treat to chat with you. MB: The pleasure was mine. Thanks, guys. JA: You’re gonna interview me? I’m pretty good at interjecting here too, Al. But here’s how it works. So, 35 years is what they’re looking to calculate your PIA. That’s your Primary Insurance Amount. And how they do it is that they look throughout and they’ll index that with inflation. So they’ll look 30 years ago, 35 years ago, or whatever. AC: Yeah. My first job was $5,000, I worked in the summer at a landscaping job making minimum wage. AC: Or whatever the number is. So you don’t necessarily get penalized for that low amount. JA: Right. So it’s going to be included in the number. So they look at 35 years, if you only worked 30 years, they’re just going to plug zeros in those holes. AC: OK so you have five years of zero. JA: Right. So it’s an average of 35 years. So five years of zeros – will it affect it? Sure. Of course it will. AC: And we know that you have to work 40 quarters, or 10 years, to qualify for Social Security. But if you only work 10 years you may qualify but the benefits are not going to be that great because 25 years will be calculated zero. AC: Yeah. So number two is to increase your earnings. That’s easy right. Just make more. JA: Well there’s a few things that you could do there to increase your PIA – you’ve got to continue to work. It won’t hurt you though. Sometimes people will do this. This question comes up, “I’m going to retire but I want to work part time. Is that going to affect my Social Security benefits in a negative fashion?” The answer is absolutely not. They will never reduce the benefit just because you made a little bit more money. AC: They’ll still take the highest 35 years. JA: They’ll continue to take the highest 35 years. AC: And chances are, if you work 35 years and then you work a few more, those are probably higher, even though you’re working part time that may be a first few years. JA: You got it right. So you work part time, and half time, or whatever. Those will then be in your calculation. So that could increase your overall benefit. AC: Yes. So the maximum wage for 2018 is $128,400. In other words, once you make that amount, if you do make that amount, that’s the max that you’ll get benefit for for Social Security. So if you’re something lower, let’s say you’re $60,000 $80,000 $100,000, whatever. So the idea there is, if you can improve your skills, try to earn more, maybe there will be some bonuses. or maybe you do a side hustle. You have a side job, because that would qualify for Social Security as well. If you can get as close as possible, or up to the $128,400, you’ve got a maximum benefit for 2018. JA: Yeah, but a lot of times people can’t get there. The easier way well, I don’t know if it’s easier – you just gotta work a couple more years. But no one wants to do that. AC: No, because we want to retire when we want to retire. AC: Delay claiming Social Security benefits. Because full retirement age right now, right here, right today, is 66 years of age. But very soon it’ll be 67, it’ll be gradually brought in. I think for those born in 1960 and later it will be 67, Joe. So that’s full retirement age. That’s where you receive your primary insurance amount, the full benefit. You can take it as early as 62, but it’s a reduced benefit. Or you can wait as long as 70 and you get a much higher benefit. So every year, actually every month, that you wait, it’s a higher benefit for the rest of your life. JA: Yeah. Most people don’t understand that too, that Social Security is calculated monthly. AC: Yeah. So they think, “Well OK, I’ve made it to full retirement age and there’s no point, I’m not going to work another year, so I’ll just start claiming it.” If you wait another month or two you get a bigger benefit. Not much but you get something. AC: (laughs) Everything is in accordance with Pabst Blue Ribbon. JA: That one year when we got the COLA on Social Security – it was a few years ago. JA: (laughs) But no, this is a difficult decision that people need to spend a little bit more time on when it comes to figuring out when they claim their benefits. Because when you retire before full retirement age, or even before age 70, people will claim their benefit as soon as they retire in most cases because they want to get that income in. Because we were trained and taught or whatever, or in our brains, or our fears, not to dip into our retirement accounts – as little as possible. So you want to let those continue to defer, defer, defer, defer. I don’t want to touch my investments. So what do they do? They’ll claim their Social Security benefits to have some form of income in so to preserve their assets. So they’d like to see a larger balance on their 401(k) statement, or they like to look at their checking or banking accounts and say, “you know what, I don’t have to dip or deplete these assets.” So a lot of times, psychologically, people will just take it. Please think that through. Because it might make more sense for you to deplete some of your assets to have a lot larger guaranteed income stream for the rest of your life. Because as Al alluded to, you receive a bigger benefit if you wait until age 70, but it’s substantial from age 62 to age 70. It’s what, a hundred and some odd percent! AC: It’s actually I think 76% higher waiting from 62 to 70. So in other words, if you would have got a thousand bucks at age 62, you would get $1,760, call it $1,800 at age 70. And that’s important, because if you look at the Social Security actuarial tables, in other words, how it was calculated? It was done in 1983, Joe, and that’s when we weren’t living as long as we’re living right now. So as long as you have reasonable or normal life expectancy, you’re going to do better waiting. And I know everyone wants to do the break-even analysis. What’s the break-even analysis? And depending upon what assumptions you take, it’s probably around 80, plus or minus – maybe 82 years of age. 79, 82, 78, whatever. But here’s why that may not be the best way to judge this because no one knows how long they’re going to live. And the thing is, this is a guaranteed source of income for life, that’s tax-favored. At the worst case, you’re going to have 15% tax-free of your Social Security, 85% of it is taxable. And then depending upon your state, like California for example, it’s tax-free in California. So if you have a much bigger benefit, it’s kind of like longevity insurance in a way, Joe. JA: Because if everything goes to hell in a handbasket, you still have a lot larger fixed income stream. AC: Right. And I would say especially for married couples, if you have one spouse that has a much higher benefit than the other, you might want to have that one spouse with the highest benefit wait as long as possible, because the way it works is, not only will you receive that benefit as a couple, but when one of you passes, the survivor will still get that benefit. And if you both claimed it early, then the survivor is only going to get the smaller benefit on whichever one is bigger. But – here’s the but, which is, if you need it, you need it – take it. So sometimes in a lot of cases, we know from recent studies from Voya Insurance that 50 percent of people get laid off or they leave their jobs sooner than they were expecting. Whether it’s either from caring for a family member, or their own health, or they just got laid off because the company downsized, or maybe the technology is changing and the person hasn’t kept up, whatever it may be. And so if that’s your situation, if you were expecting to work to age 70 and now all of sudden you’re out of work at age 62, and if you can’t find a job and you don’t have other resources, then yeah, you’re going to have to claim it. JA: What else is on the list? AC: Move to a state where your benefits won’t be taxed. JA: California here you come! AC: That’s right. So it turns out there are 13 states that actually do tax some or all of Social Security. Hopefully, you don’t live in one of these states: Colorado, Connecticut, Kansas, Minnesota, your home state. JA: Yep. That’s why I moved. AC: Yep exactly. (laughs) Missouri, Montana, Nebraska, New Mexico, North Dakota, Rhode Island, Utah, Vermont, and West Virginia. All of those states tax Social Security at least all or part of it, whereas the other 37 states, it’s tax-free, California being one of them – which is where we record from. JA: I was like “Oh God where’s he gonna go? Oh, boom.” (laughs) But that’s a big deal. I think we just talked about the tax treatment of Social Security, which I think a lot of times people will not include in their overall calculations. AC: Well I think that’s right, because if you look at most people’s income in retirement, and when I say most people, I’ll say most people that have saved into retirement accounts – typically their 401(k)s, their IRAs, maybe their defined benefit plans from their employer – that money, 99% of that comes out as ordinary income. You pay a high tax rate. And so if you add Social Security on top of that, you’re just now paying even more tax and the fact that Social Security is tax-favored, meaning, at worst case, you only have to pay tax on 85 percent of Social Security, 15 percent is tax free – in some cases, you only pay tax on half of Social Security. In other cases, Social Security is completely tax-free. And then if your state is tax-free, then you at least have some of your income that’s tax-favored, because a lot of your other income may not be. JA: Right. So you know you hear of the brokerage firms out there, and the bond brokers, and they talk about municipal bonds and they talk about the tax-equivalent yield. So if I have a municipal bond, it’s tax-free to me. And then let’s say that bond yield is 3 percent, but then they’ll say, “well, the tax-equivalent yield is closer to 6.” Why don’t we do that with Social Security? I think more people would be educated on it. Because hey, yeah, you’re getting let’s say an 8 percent delayed retirement credit on the overall benefit, but it’s more than 8 percent because you’re not getting taxed on all of that. And you’re not getting taxed at all if you live in the state of California. So just understand the taxation of all of your income. You got one more? AC: I do. The fifth one is, develop a strategy with your spouse, and boy, this changed a lot a couple of years ago. JA: Yeah. There was file and suspend, collect now, collect later. There were restricted applications, there was all sorts of stuff, but now it’s just looking at who has a higher benefit? I think you alluded to this. You look at the spousal benefit, you look at Survivor Benefits, and just making sure that both of you are claiming at the appropriate time. One spouse might want to claim a little bit early and the other one might want to wait until age 70. AC: Yeah, and generally it’s the one with the higher benefit would wait till age 70, because then, again, as I said, that’s the benefit that both either survivor would end up with. And yeah, in many cases Joe, I would agree with you. The one with a lower benefit, they could start rather early if they wanted to, potentially. Now you also have to look at the spousal benefit, which is half of the higher wage earner’s benefit. However, that’s only half at full retirement age. When you get past there, there’s no additional benefit. AC: Really? One of the highest ones that you actually did on a Friday in January? JA: On YouTube of OUR YouTube channel. Andi, she’s going to correct me – compliance. What, we got 15 views! (laughs) It’s very informative. How many views do we got, Andi, on our YouTube channel? AL: I think it’s about a million now. JA: We have a million views. JA: And then how many total minutes watched? AL: Oh, I can’t remember off the top of my head. 5 million I think, something like that. AC: Well I think I watched it 999 times myself because I just love that stuff. (laughs) Especially, Joe, your Social Security. JA: We got all kinda stuff on our website! AC: Well there you go. This show has been nothing but plugs the entire way! 36:58 Can I Take a Lump Sum Social Security Benefit to Buy a Red Ferrari? AC: It was pretty good except for answering all his questions. AC: (laughs) It’s all about the red Ferrari. JA: It is. John, I got bad news for you. AC: Yeah the rules changed 2015 and into 2016. AC: April 28, I believe, 2016. Maybe 29th. I remember it was confusing what day it was. Plus or minus a day. AC: I can say end of April. Okay. It was within the 20th or 30th of April. JA: Here’s what he’s referring to, for those of you taking score at home, is that there was a cool way that you could apply for benefits, it was called file and suspend. So you would file for your benefits and then you would suspend the benefits and let your benefits accrue. And there were two main reasons why people did this. I would say the majority of the people that did it was to trigger a spousal benefit. So what a spousal benefit is, is that if you’re married, your spouse could either take their own benefit or half of yours. But for the spouse to claim a spousal benefit, you needed to be claiming your benefit. And so in some instances it didn’t make sense to claim the benefit. So you could file for your benefit. Social Security turns it on, but then you say, “no, I just want to suspend it.” So it’s on but you’re suspending the benefit so you’re not receiving payment, and it’s still accruing. It’s like you never took it. But then that triggered for a restricted application for the spouse to say, “you know what, I want to take the spousal benefit.” The spouse could take that benefit and let yours continue to accrue. And then you would turn yours on at age 70 like you never took it. JA: If you want a Ferrari. AC: You want a Ferrari all at one time! Where’s that money? Oh, lump sum! JA: John, most of the time people did that because they had shortened life expectancy. AC: True, but what’s wrong with a red Ferrari? JA: Well you might go broke! (laughs) Take the larger benefit! So anyway John, sorry about that. AC: So anyway, those rules changed – both of those rules changed, so that you can’t do that lump sum anymore. 40:33 – Should I Apply For Medicare? Which Parts? JA: Okay so this is from “confused in Northern California.” OK you ready for this, Big Al? AC: Yeah let’s do it. AC: OK. Because there’s part A, part B, part C, part D.
AC: We got a little smiley face. JA: Oh, thank you very much! All you have to do is write a little something something. What’s it called? Say you like the show on the…? On the podcast. It’s called a review or something. AC: Oh, a show review, podcast review. JA: Yeah. I’m not asking him to do that, but if he would like to do that, that would be sweet. AC: We wouldn’t complain. Especially if there was a smiley face, love your show and podcast. JA: Yes, we might answer your question. OK so here’s the deal. I would definitely sign up for part A. There’s no cost to that, because you’ve already paid it throughout your life. Part B, you could hold off on that until you actually retire. So yeah, checking out cost and things like that, it could probably save you some money. But that’s where you have to do some comparable shopping. AC: Yes so this is for a spouse, and I agree with that. Part A, there’s no cost to that. Part B there is a cost for that. JA: It’s about 165 bucks a month. AC: Well yeah, and it depends upon your income. AC: If you’re following our advice? JA: Well no, because he’s making a ton of money! AC: Yeah right. So at any rate, that part A, there’s no current cost. You’re right. You’ve already paid the cost for that. So there’s no problem there. Part B, since it costs money and since your policy is already better, then the Medicare, you might as well just keep with that. Now what’s confusing Joe is, you go to the website and internet sites and they say, “oh, if you don’t sign up for part B when you’re 65 you get penalized.” And that’s not true, as long as your spouse has an appropriate health care plan. Which we won’t go through. JA: Right. There’s an exemption to the penalties as long as you qualify, and this individual does qualify. AC: What did I say? JA: Medications. Well it’s the same thing. Whatever. AC: You’re correcting me? I thought I said some bizarre word. AC: (laughs) OK, prescriptions. Anyway, and then Part C, it’s sort of a combination of A, B and D. So you don’t need that. So just Part A.
JA: I encourage anyone that has questions on Medicare. We did a three or four part webinar series on the A, B, C, and D’s of Medicare. AC: We did – Jason Thomas. AC: She said, “call me Dr. Katy.’ That’s easier to say. JA: She’s probably one of the smartest people that you and I have ever talked to in regards to Medicare. I think we put together something that we have on the website too, a white paper of some sort that she wrote that we gave away. If not, just email me and I’ll find it. But no, go to our website, PureFinancial.com, check us in the Learning Center there. There’s a ton of great videos. If you want to spend a couple of minutes to learn about Medicare. Medicare videos, white papers, downloads, we’ve got it all at YourMoneyYourWealth.com, just type Medicare into the search at the top and you’ll find all those resources you need.